Hassle free service to Top End residents and businesses. 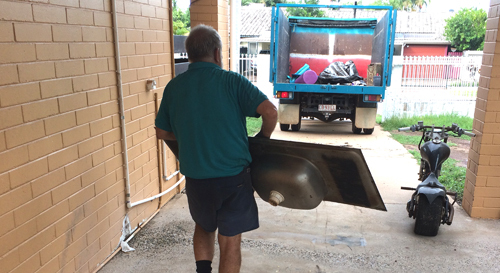 Top End Junk Removal is a full service junk removal business that offers a hassle free service to Top End residents and businesses. A two man team and truck clear junk from anywhere on the property, give the area a thorough sweep-up, and then take it all away to be reused or recycled. We take all types of junk and bulky waste, from furniture, household and electrical appliances to garden waste, DIY and builder's waste. We service both residential and commercial customers. 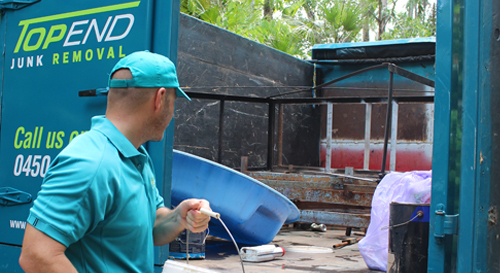 Top End Junk Removal offers the complete service so all you have to do is point at the junk you want removed and we will take care of the rest. We charge according to the amount and type of junk and the time it takes us to load it. We provide up front rates based on volume which include all disposal fees and labour costs. Prices are similar to skip hire but with the added benefit that you ONLY PAY FOR WHAT WE TAKE and you don't have to fill the whole truck like you would a skip!